This heat is unbearable!!! While we swelter (and I can't even believe I'm posting a winter coat now! 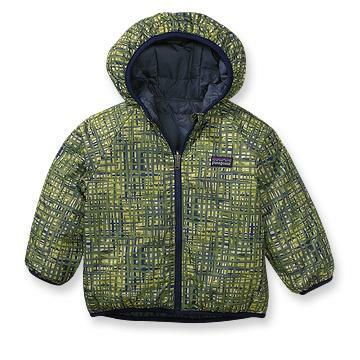 ), I couldn't help but share this totally awesome boys jacket by Patagonia. Outerwear for little boys tends to be on the boring side of the fashion sense, but the graphics on this little number are so hip, and to boot, it is reversible when something calls for a more subtle look (say, shul?). Best part, it's on sale. categories / Baby, City Find, Sale Alert!! !